Saloon Shootout-Practice your shooting skills with this fast paced game. Includes darts and gun. 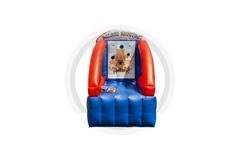 Can be added together with any of the other inflatable carnival games. One blower can power all of them. Rent 3 or more and they will be 60.00 each.